The moon: shown, here, in the softened graphic tonalities of a heliotype. The image has captured its puckered surface and alien topography - the very details that the unaided human eye cannot make out when looking up into the night’s sky. But this is not, in fact, the moon. Plate VI in James Nasmyth and James Carpenter, The Moon: Considered as a Planet, a World, and a Satellite (London: John Murray, Albemarle Street, 1874), University of St Andrews Library, Photo QB581.N2C2. In 1874, James Nasmyth and James Carpenter published their influential text on lunar geology, The Moon: Considered as a Planet, a World, and a Satellite. The book was among the first to be illustrated with photo-mechanical prints, which were lauded by one of the book’s contemporary reviewers as among the most ‘truthful and striking representations of natural objects’ ever encountered by a student of science. 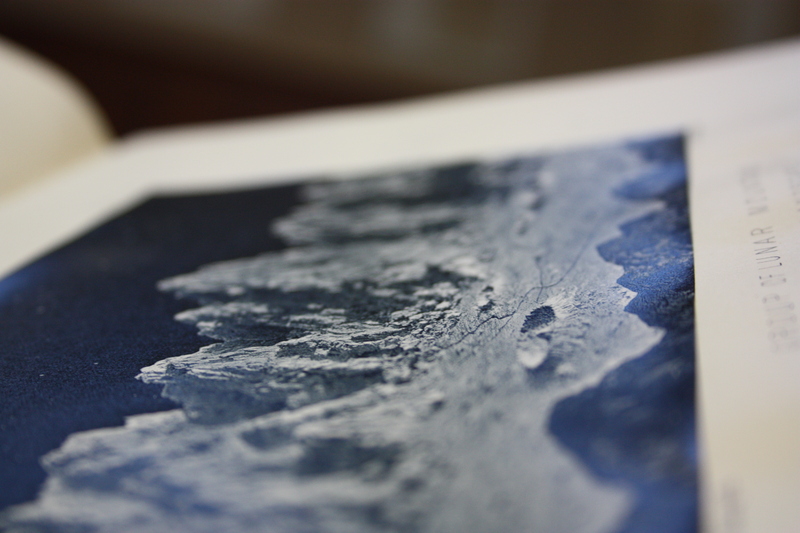 However ‘truthful’ they may appear, though, the illustrations are not real photographs of the moon - they are curious, hybrid objects in which manual, mechanical and indexical processes are densely layered. Detail. Plate XXI in James Nasmyth and James Carpenter, The Moon: Considered as a Planet, a World, and a Satellite (London: John Murray, Albemarle Street, 1874), University of St Andrews Library, Photo QB581.N2C2. The book was the culmination of decades Nasmyth had spent studying the moon through a large telescope of his own design. During that time Nasmyth, a retired industrial engineer and amateur astronomer, produced numerous studies and maps of the moon, which recorded its topographical features with extraordinary lucidity and precision. In order to reproduce the variegated textures and luminous dimensionality captured by his drawings, Nasmyth and Carpenter looked not to expensive steel engraving but rather to photography. And they aimed the camera not at the lunar surface itself but, instead, at a series of hand-made plaster models based on Nasmyth’s drawings. Technical limitations meant that, while it was already possible to photograph the moon, the kind of closely framed, intensely magnified views Nasmyth and Carpenter sought could only be achieved from a model. The finished plaster models were photographed outdoors in raking light, which served to both recreate the oblique angle of the sun’s rays on the lunar surface and reveal the subtle topographical variations of the model’s surface. Plaster was a particularly apt medium for recreating the lunar surface, not least because of it was relatively inexpensive, readily available, and could be moulded and scraped with relative ease. It was also the primary material in which three-dimensional forms were copied. Plaster casts of classical sculpture, for example, could be found in many of Europe’s art collections in the late nineteenth century. Because this material was used to directly mould and cast that which it copied, plaster thus often claimed a privileged, indexical relationship to the original object, as a ‘true copy’ - and was therefore particularly well suited to photography, a medium that was increasingly marshalled in the name of scientific objectivity in the second half of the nineteenth century. Yet, ironically, ‘true copies’ are precisely not what we encounter, but instead the collision of manual artisanal labor and industrial photomechanical reproduction. 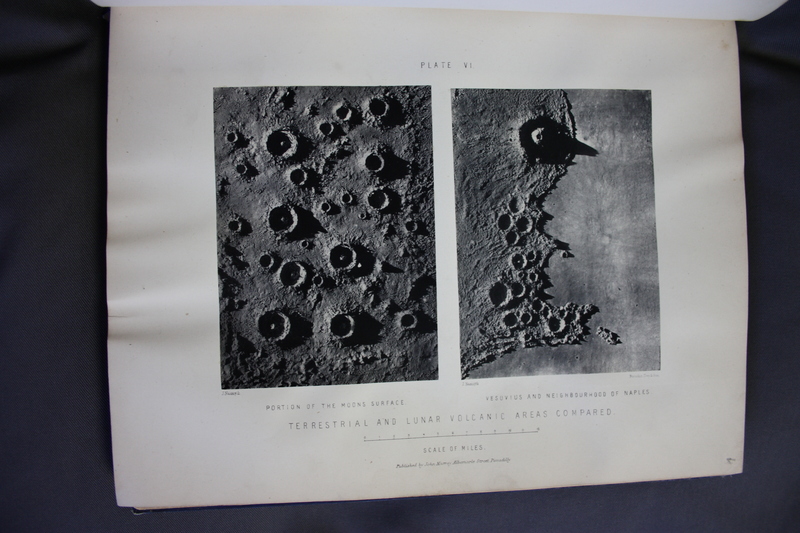 James Nasmyth and James Carpenter, The Moon: Considered as a Planet, a World, and a Satellite (3rd edition, London: John Murray, Albemarle Street, 1885), pp. 34-35. 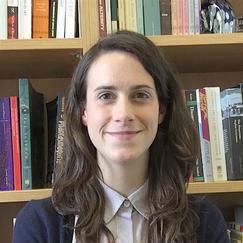 University of St Andrews Library, Photo QB581.N2C2E85. The Moon also includes numerous examples of the kinds of schematic diagrams that were more routinely used to illustrate scientific texts. 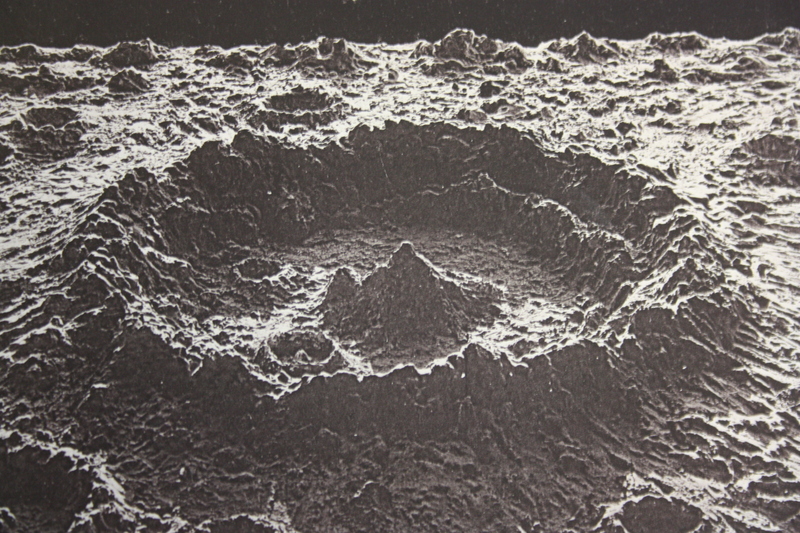 These engravings chart astral trajectories, outline hypothetical cross-sections of the planet’s subterranean layers, and reveal the mechanisms by which Nasmyth and Carpenter believed that ancient volcanos must have moulded the lunar surface. The book’s combination of different image-types and reproductive technologies enabled it to convey more extensive and varied information, while also strengthening its claims to scientific ‘truthfulness’. The diagrams, outline drawings, and photo-mechanical illustrations enable the viewer to plumb the moon’s depths and scale its heights, to examine it at close range and also chart its course through the cosmos. Detail. Plate XXV. 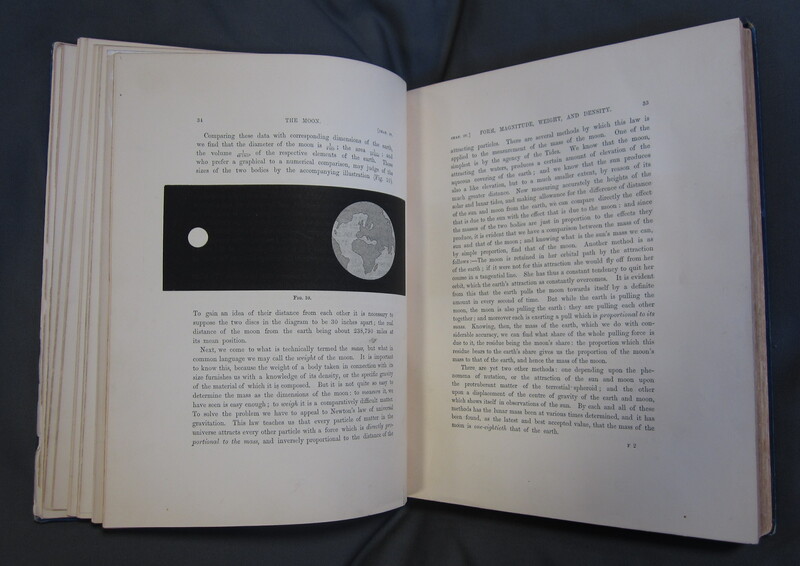 James Nasmyth and James Carpenter, The Moon: Considered as a Planet, a World, and a Satellite (3rd edition, London: John Murray, Albemarle Street, 1885), Woodburytype. University of St Andrews Library, Photo QB581.N2C2E85. In the third edition of the book, printed in 1885, many of the heliotypes from the first edition were reproduced as woodburytypes, and some were noticeably altered. The resulting images offered greater tonal contrast and were able to capture even more of the models’ textural details. It is perhaps fitting that these woodburytypes took on a kind of topography of their own - the dark expanses and inky lines that play across their surface are subtly but noticeably raised up from its more muted passages. Yet another surface for the reader to explore. Fully digitised copy of the second edition (1874) available here.